Have you missed the Ramanand Sagar's Ramayan? Or, want to see Aamir's First TV Show Satyamev Jayate again? Now you don't need to record the telecasts on your set top box. 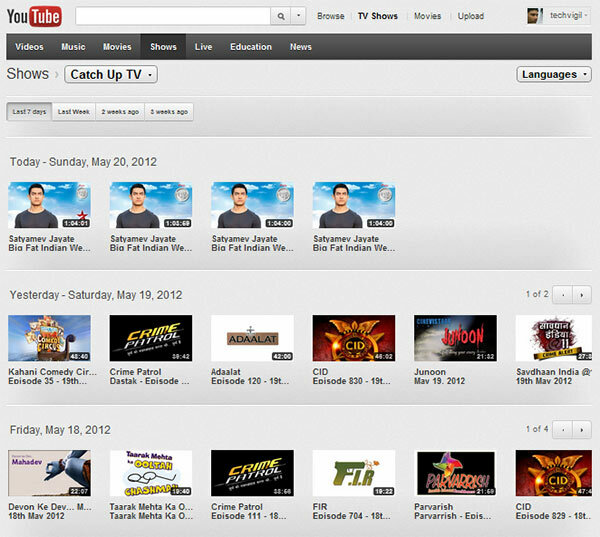 YouTube has made available over 1500 bollywood movies and more than 300 Indian television shows on its website. It doesn't have just Hindi shows, but Tamil, Telugu, Bengali, Gujarati, and Punjabi regional shows are also available for everyone to watch. Now time and place should be no bar to enjoy your favorite shows. Latest episodes are updated on youtube.com/shows page. The content includes shows from nearly all major Indian broadcasters such as Sony Entertainment Television, Colors, ImagineTV, Star India, and VikatanTV. At this time more 1900+ episodes are available in superb quality to watch. Programs are classified into genres like action, drama and comedy, as well as the latest and top watched episodes are featured on the page. Most of the new shows are available in HD (720p), while older episodes are up to 480p. Shows such as Bade Acche Lagte Hai, Crime Patrol, Adaalat, CID are classified as drama. Comedy Circus, FIR, Office-Office, Tedhi Baat are under comedy. Ramayan, Chanakya, Mahabharat, Shri Krishna are under classic TV. MTV Roadies, Big Boss, Boogie Woogie are under reality and game shows. Balika Vadhu, Uttaran are under soaps. I found there every single episode my mom couldn't watch while making dinner for our family. Now she is very happy with all her favorite shows in her control. Is your favorite one missing there? Share in comments.